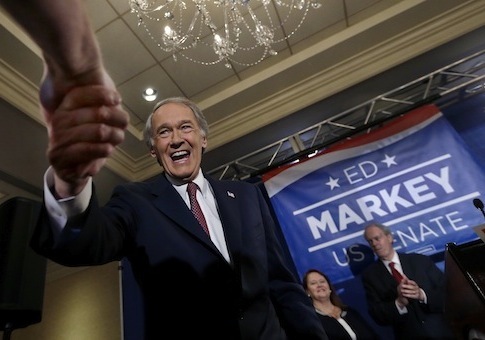 Rep. Ed Markey (D., Mass), fresh from securing the Democratic nomination for Senate, blasted dark money groups on Wednesday even as such groups claimed credit for his decisive primary victory. Two dark money environmentalist groups, the League of Conservation Voters (LCV) and the NextGen campaign, claimed at least partial credit for securing the nomination for Markey. LCV claimed it played a "decisive role" in his win. "With low turnout out in tonight’s special election, it is clear that our work was an important part of Markey’s victory," the group said in a statement after polls closed on Tuesday. The NextGen campaign, run by billionaire environmentalist Tom Steyer, said they "succeeded in … injecting climate change into the race," and forced Rep. Stephen Lynch (D., Mass), Markey’s opponent, to change tactics "in direct reaction to our offensive." Markey blasted the involvement of such groups on Wednesday despite the large sums spent by dark money groups supporting Markey’s bid or attacking Lynch’s during the primary. "It’s undisclosed, it’s unlimited, and it is unseemly to have that kind of outside influence not be known by the voters of the state of Massachusetts as they would be casting their ballots," Markey said of dark money groups on MSNBC’s Daily Rundown. Asked about the disconnect between Markey’s rhetoric and the large independent expenditures on his behalf, campaign spokesman Andrew Zucker said Markey "has fought to keep money out of politics, reform campaign finance laws and overturn the Court's misguided Citizens United ruling." Republicans said Markey’s comments and his general antipathy to the post-Citizens United campaign finance landscape—he has compared the Supreme Court’s 2010 decision to Dred Scott—are hypocritical, given the involvement of dark money groups in the race. "There is no greater height of hypocrisy," Republican nominee Gabriel Gomez said in an interview. Markey "has been down there [in Washington] for 37 years taking outside money to further his career and taking it from groups or industries that he regulates or has control over," Gomez said. "Ed Markey railing against ‘special interest’ money from Washington is like the Pillsbury Doughboy complaining about carbohydrates," said Brad Dayspring, communications director at the National Republican Senatorial Committee. LCV and NextGen both focus on environmental and energy issues. Markey is the ranking Democrat on the House Natural Resources Committee and also sits on the Energy and Commerce Committee. The role of dark money groups frequently came up in the contest for Massachusetts’s Democratic Senate nomination. Markey and Lynch both agreed to sign what they called the "People’s Pledge," which was designed to reduce the roles of those groups in the race. Markey falsely suggested the pledge prohibits involvement by such groups in the race on Wednesday. It only prohibits political advertisements and direct mail funded by dark money organizations. The pledge’s focus on campaign advertisements and mailers is seen by some as a major loophole, since it does not prohibit independent expenditures on activities such as polling, canvassing, and other non-media campaign activities. Markey benefitted from well over a million dollars of independent expenditures by Super PACs and other dark money groups during the primary despite the pledge and his insistence he "[doesn’t] want funding that comes in from these Super PACs," according to data gathered by the Sunlight Foundation. LCV spent more than $830,000 supporting Markey’s primary bid through a Super PAC and an affiliated 501(c)(4) advocacy group. NextGen independently spent more than $350,000 in opposition to Lynch. Markey’s top three independent expenditure groups in the race—LCV, NextGen, and the Service Employees International Union—spent more than $1.5 million supporting Markey or opposing Lynch. Those totals dwarf the $93,000 in independent expenditures supporting Gomez’s candidacy. Markey claimed on Wednesday that Gomez’s refusal to sign the "People’s Pledge" undermined his claim to be "a new kind of Republican" despite benefitting from more than fifteen times as much independent cash as Gomez. Gomez, a private equity executive and former Navy SEAL, rejected that characterization. "People have the right to express their views" through independent political expenditures, he said. "Politicians takes pledges because nobody trusts them," Gomez said of his decision to pass on the People’s Pledge. "The only pledge I’m going to take is to protect the Constitution." This entry was posted in National Security and tagged Climate Change, Congress, Ed Markey, Gabriel Gomez, Progressive Movement, Super PACs. Bookmark the permalink.